There’s no denying that de-cluttering your home is a big job. Getting rid of years’ worth of clutter is a time-consuming task and it’s hard to know where to begin. The best way to start organizing your home is to break it down into more manageable and less daunting tasks. Try to tackle the job by room to make sure the clutter is clear from each space before you move onto the next one. Once you complete a room, you’ll have the satisfaction of knowing that the task is done properly. The kitchen is one of the most likely rooms in your house to attract clutter – so much so that we have a whole post dedicated to clever kitchen organization hacks. Cabinets, drawers, countertops are all magnets for mess, so we’d recommend carrying out these tasks regularly. Cabinets – Empty each cabinet one at a time and get rid of anything that’s expired or no longer is needed. (Remember to recycle jars and cans instead of throwing them out). Drawers – Again, empty each drawer one at a time and throw out/recycle anything that is no longer needed. You’ll be surprised how much junk ends up in your kitchen drawers! Countertops – Take everything off your countertops and only put back the items that absolutely need to be there (kettle, toaster, coffee machine, fruit bowl, etc). 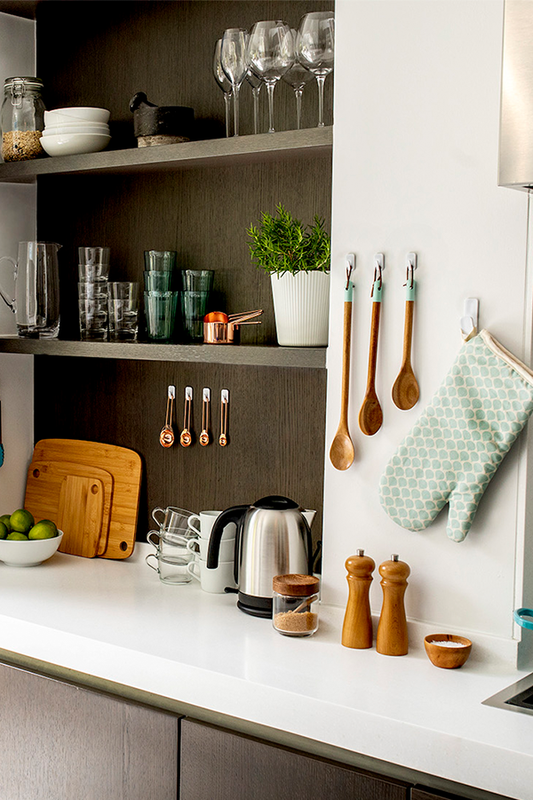 Try to use wall space wisely – a great way to organize your worktops is to hang kitchen accessories and utensils on the wall with our VELCRO® Brand HANGables® Adhesive Hooks. Bathrooms don’t have tons of storage space so it’s important to use it wisely. Focus on these two main areas while you’re de-cluttering your bathroom. Medicine cabinet – Empty the whole cabinet and throw out/recycle any expired medicines, old make-up or toiletries that you no longer need. Only put back what you’re going to use. Bath/shower area – It’s easy for your bath or shower area to become a haven for empty shampoo and shower gel bottles (the problem gets worse when there are multiple people in the house). Recycle all your empties and get rid of anything that you no longer use. 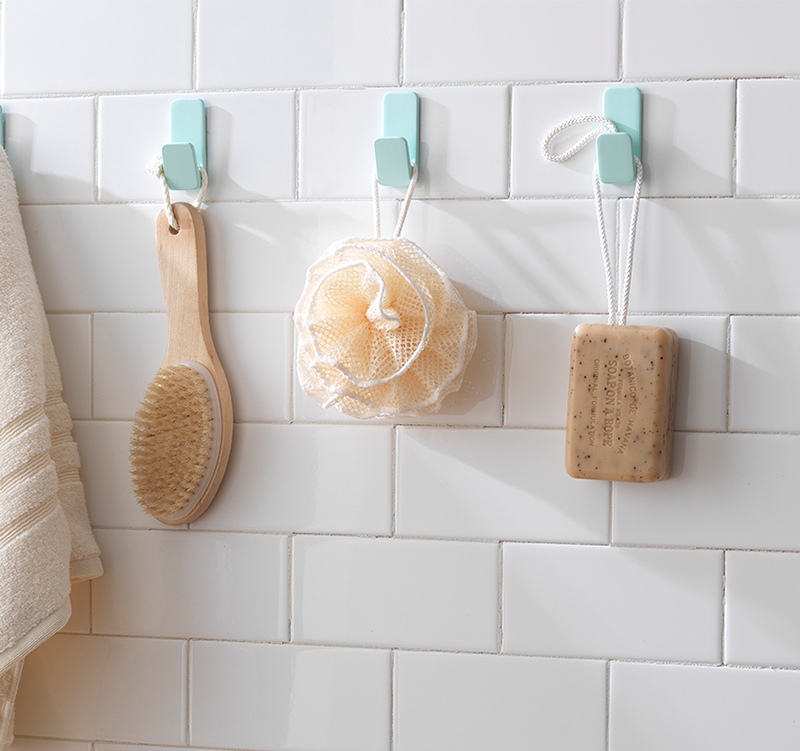 Then hang up all your shower accessories with VELCRO® Brand HANGables® Adhesive Hooks (they stick firmly to tiles so you don’t have to drill a hole). Adhesive hooks come in handy all around the house – check out more clever ways to use them here. Your living room should be a place for you to relax and unwind – not stress out about the mess. Here are a few de-cluttering tips to guide you in the right direction. Bookcases/coffee tables – One of the first areas to tackle while you’re de-cluttering your living room is any bookcases, cabinets or coffee tables that may attract clutter. Recycle old magazines and newspapers and donate any old DVDs that you no longer watch. Remotes – Do you feel like your living room filled with an excessive number of TV remotes? 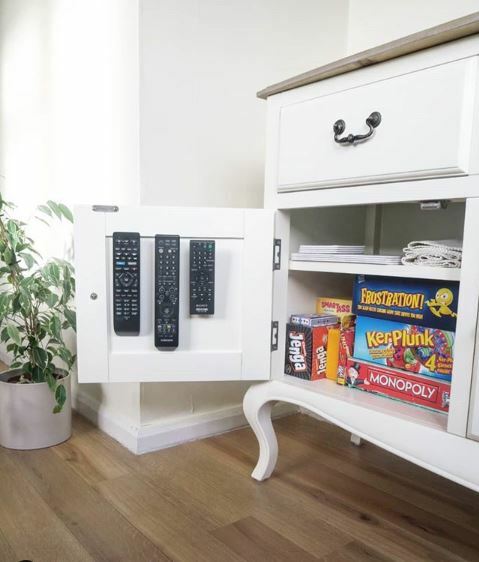 Keep them tidy by setting up a permanent place to store them – My Organised Bubble used VELCRO® Brand Sticky Back fasteners to stick her remotes to the inside of a cupboard door to keep them hidden. TV cables – Look behind your TV and you’ll probably find a bird’s nest of wires tangled behind it. This is a hazard, not to mention an unsightly mess. Keep loose wires neat by wrapping them up with the VELCRO® Brand ONE-WRAP® Reusable Ties that can be cut to size and re-used again and again. Check out our post on how to keep cables tidy in every room of your house for more cable organized tips). You’ll be surprised how much more productive you are when you’re not surrounded by clutter, so take some time to de-clutter your office. Desk drawer – If your desk drawer is full of junk, it’s time to de-clutter it. Empty it out and only put back the items you need when you’re sitting at your desk. Old files and papers – It’s easy for old files and papers to pile up on your desk, and chances are you don’t even need them anymore. Take some time to go through all your papers and recycle anything that you no longer need. Then try and go paperless to prevent future cluttering (it’s tidier and much better for the environment). Wires and cables – Home offices are havens for messy wires and cables (think computer cables, laptop chargers, phone chargers, headphones… The list goes on). Keep them neat and tidy by wrapping up loose wires with VELCRO® Brand ONE-WRAP® Reusable Ties. Your office will be much less cluttered and you’ll save space. Last but not least, is the biggest task of all – your garage. It may feel like you have a mountain of clutter to tackle but it’s easy to break up your garage into smaller, more manageable tasks. Start by emptying out as much as you can and throw out/recycle anything that’s broken or unwanted. Then work on your garage storage to make sure this part of your home stays organized and doesn’t become a dumping ground for clutter in your house. DIY tools and gardening equipment – It’s great to have these things to hand for when you need them but not at the cost of cluttering your garage. Make use of your vertical space by sticking tools and gardening equipment to the wall with VELCRO® Brand Heavy Duty Tape. Bikes – Another great way to make use of your wall space is to hang your bikes with VELCRO® Brand Easy Hang Straps (this is also a great garage storage idea for suitcases and other heavy items). 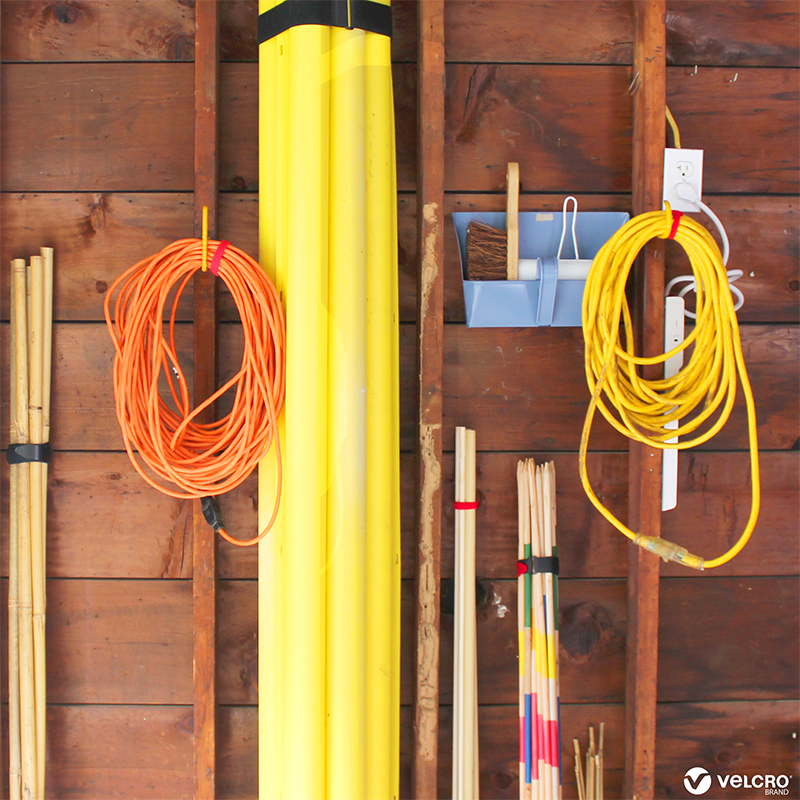 Cables and hoses – Extension cords, hoses and other wires can take up precious space in your garage. Wrap up bulky cords, cables and hoses with the VELCRO® Brand Wide Straps to keep them neat and check out these ridiculously easy ways to organize your garage for more useful tips. Ready to de-clutter your home? Let us know if you try out any of our de-cluttering tips or post your own home organization ideas and don’t forget to tag us on social!